When Gullermo Del Toro used Pan’s Labyrinth as an allegorical scalpel to dissect the horrors of the Spanish Civil War, he opened a door to possibilities that few filmmakers have had the talent and imagination to explore. Iranian filmmaker Babak Anvari, however, has demonstrated that he has the chops to take on a project that blends paranormal horror with those that are summoned by humanity’s own perverse desire to destroy itself. 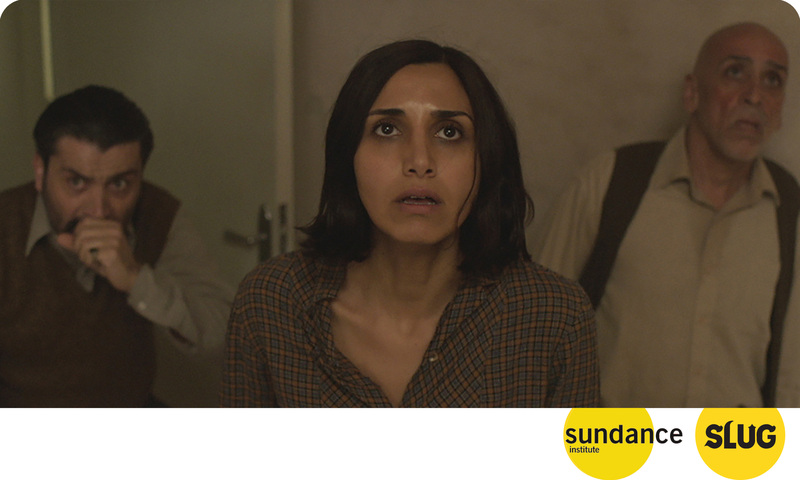 Before Under the Shadow really starts to get under the audience’s skin, we’re introduced to Shideh (Narges Rashidi), an Iranian woman who is focused on reapplying to university in order to finish her medical degree. When her appeal is rejected because of her past political activism, she retreats into a shell of hostility and resentment towards her husband Iraj (Bobby Naderi) and daughter Dorsa (Avin Manshadi). As Shideh tries to reconcile her frustrations, a neighbor cautiously mentions the djinn, demonic creatures from Middle Eastern mythology. These beings feed on negativity, and their arrival is heralded by an unexploded Iraqi missile that crashes into Shideh’s apartment building. It’s a fascinating premise—not only does this film explore the real-life horrors that the citizens of Tehran experienced during Iran’s eight-year-long conflict with Iraq, but it uses that conflict as the backdrop to a seriously scary horror film. The crack that the missile leaves in the ceiling of Shideh’s home becomes both a stark image of life in a besieged city and a doorway to the unseen world of the djinn. As Shideh’s husband is drafted into the Iranian military and her neighbors slowly flee the city, Shideh’s wounded pride doesn’t allow her to see the danger that she’s in. Choosing to remain in the apartment with Dorsa, she believes that she is safe from the Iraqi weapons—but she fails to see the fact that it’s not the Iraqi military that she needs to be afraid of. When the djinn fixates on taking control of Dorsa, it uses the resentment that both characters feel for each other to slowly drive a wedge between them. Both Rashidi and Manshadi are powerful actresses, each capturing their characters’ respective emotions. As their paranormal visitor starts to gain power, Anvari establishes a tone that is reminiscent of walking barefoot through a dark room full of mousetraps. There was one cop out scene that used a toaster to illicit a cheap jump scare out of the audience, but the remainder of the film deftly blends those scary sucker punches with scenes that prefer to leave the frights to the audience’s imagination. It’s a tight use of editing and cinematography, and all of it is used to create nearly unbearable tension in the audience while somehow managing to scare them at the most unexpected moment. Under the Shadow is easily on its way to becoming one of the best films of the year, and it enjoyed some spectacular buzz among my fellow press nerds. With the success of fellow Iranian Ana Lily Amirpour’s fantastic vampire film A Girl Walks Home Alone at Night a few years ago, Babak Anvari is helping to solidify the voice of Iran’s filmmaking community—and it’s very exciting. Not just because it’s high time that American cinema got a fresh injection of quality horror films, but it also goes to show that Iran is a country of so much more than it gets credit for on the nightly news. Anvari and Amirpour are only two of a rich community of Iranian artists, and it’s important to recognize the work that they’re doing to build cultural bridges with their media. It’s so much harder to hate someone when you find out that they share your passion for horror movies.